The wreck of the SAS Pietermaritzburg in False Bay was the scene of a tragic accident this week when a well known diver died. This wreck was purposefully sunk at its location about 6 kilometres past Simonstown towards Cape Point. 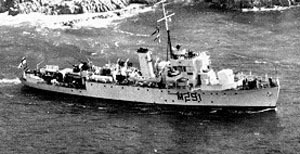 The ship was bought by the South African Navy in 1947 and was the ship that led the D Day Invasion of Normandy during the second world war. It is a tradition of the SA Navy to sink their ships in False Bay once they become too old. They are stripped of all their armour, guns and electronics before being sent to the bottom. The SAS Pietermaritzburg is lying upright on the bottom of the bay and is apparently an interesting if not eerie dive. As False Bay has a relatively sandy bottom there are no natural reefs in the bay. It is because of this that the ships are sunk in the bay to form artificial reefs where fish can make their homes. This ship was sunk in 1994. Not only does the SAS Pietermaritzburg lie in False Bay but a number of other ships have been purposely sunk in the bay to form some more artificial reefs. These ships are the SAS Transvaal and SAS Good Hope and they lie in about 35 metres of water about 4 kilometres off Millers Point. The Rockeater – a diamond dredger, The Princess Elizabeth and The Oratava two fishing trawlers also lie nearby. To see these wrecks and the marine life on them artificial light is needed . All of the wrecks above can be reached by boat from either Simonstown, Kalk Bay or Millers Point. Not being a diver myself I imagine that these wrecks are out of bounds to divers who are not trained in deep diving.